OK, I’ve had success with my other attempts… time to iterate! Each batch below also has 1/2 teaspoon DAP yeast nutrient, 1/2 teaspoon pectic enzyme, and enough apple juice to top off a 1-gallon jug. Who knows? Could be amazing. Gorgeous color! Apple, cranberry, and honey seem like a natural combination to me. 10 oz honey… whups, meant to do 1 lb but forgot. Interestingly, this batch developed a layer of sediment at the bottom after only a couple hours on the countertop. I’m wondering if this is the pH level… I had planned to check this for all the batches but I forgot. I’ll do it when I rack them, assuming that primary fermentation is successful. I want to see what changes when only the yeast is different. 2017-06-25: Checked temperature today, all are at 69 F. Interestingly, the cranberry is actually about 1 degree warmer. 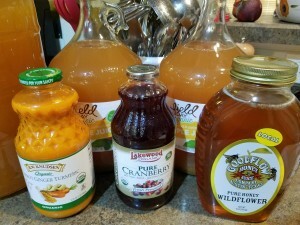 2017-07-03: Racked them all and added apple juice to top them off… say about a cup each. I haven’t ever done that before… I figured it will help pump up the apple flavors and and provide for a nice long secondary fermentation. Will reduce the ABV a bit since all these batches had added honey. 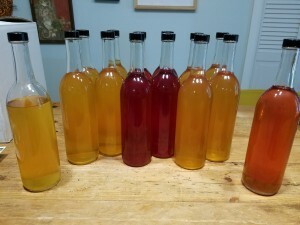 The carrot and cranberry batches are fairly clear compared to the plain apple cyser. The cyser also had more foaming going on still where the other two had slowed way down. Heh, I forgot to check the pH on them, I wanted to do that to see if the cranberry was unusually acidic. Whups! I’ll check it at the next racking in a month or so. 2017-07-05: Our air conditioning went out for almost 2 days so all in-progress brewing was subjected to 90° F temperatures. I’m not too worried about these b/c the primary fermentation was already done. 2017-07-16: Bottled them all and put ’em in a box. So pretty! We tasted a bit of all three. Lynell did not like any of them. 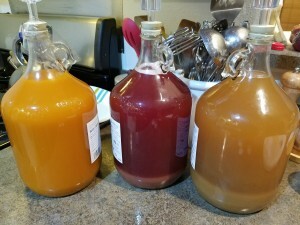 I like the cranberry a lot, the carrot is interesting and tasty, and the plain old cyser is pretty boring. We’ll see what happens after a couple months or so. I bought some sulphate to keep them from getting fizzy but in the end I decided I still don’t wanna mess with sulphites. So these are all organic which means it’s healthy! Drink all you want! Right?